After our attempt to drill the Voyageurs target did not reach sufficient depth due to the impressive hardness of the rock , the team is beginning to finish up its activities at this location before heading a bit further uphill to find a more suitable (i.e., softer) drill target. 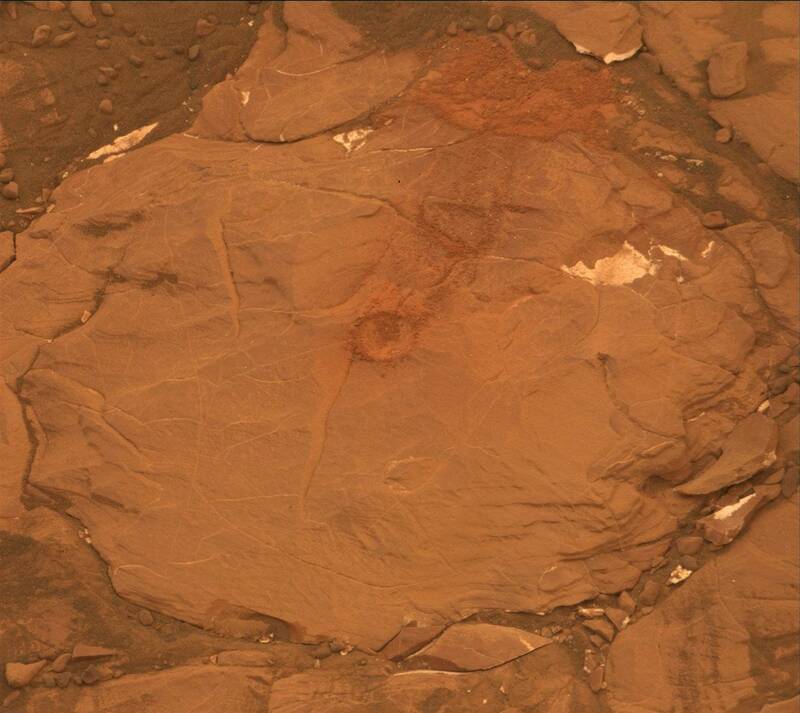 All evidence suggests that this rock target is one of the hardest yet observed in Gale crater, a property that may be indicative of this entire section of the Vera Rubin Ridge. To a geologist, variations in rock hardness could indicate several different physical and chemical properties about a rock. It is important for us to further characterize and understand why this rock unit is so much harder than the underlying rocks within the Murray formation. Could this increased hardness be related to changes in water chemistry as the sedimentary rocks were being deposited? Or, could this increased hardness be due to subsequent cementation as iron-rich water was injected into the previously deposited sedimentary rocks? In order to address these possible formation mechanisms (and countless others), we must continue to gather data on the physical, chemical, and mineralogical properties of this portion of the Vera Rubin Ridge. Today's rover activities contain a combination of scientific investigations and engineering activities. The plan starts with a short imaging science block around 11:30am local time, where Mastcam will be used to acquire images of the surrounding landscape to search for short-term changes to the surface, including sand migration and changes to dust cover. Navcam will also be used to investigate the atmospheric dust content and to search for nearby dust devils. Following this block of observations, Curiosity will use the Mars Hand Lens Imager (MAHLI) high-resolution camera to investigate the shallow Voyageurs drill hole and to image the rover wheels with its dust cover closed (to avoid dirtying the camera lens). After a short nap and a data uplink to the Mars Reconnaissance Orbiter as it passes overhead, Curiosity will embark on another block of science activities beginning around 3:00pm local time. This second suite will include Mastcam images of the dusty atmosphere, a ChemCam laser-induced breakdown spectroscopy (LIBS) chemical analysis of the Voyageurs drill hole, a LIBS measurements of the ChemCam calibration target, and a follow-up Mastcam documentation image of the drill hole. This will conclude the sol 2114 science activities. I served as the geology science theme lead during yesterday's plan, when the team first had to deal with the realization that the drill activities at the Voyageurs target did not penetrate deep enough into the target to acquire materials for analysis onboard the rover. While disappointing, the information gathered about the rock properties and drill activities led to a deluge of productive scientific discussions about how to proceed and what these observations tell us about the geologic environment that Curiosity is investigating. It's moments like these that remind me of how lucky I am to be working with such an impressive group of scientists and engineers, who can collectively turn a frustrating sigh into a gasp of excitement as we think about our next observations and what more we have to learn about this interesting and foreign environment.